Here is a truth: the devil has power. Here is a greater truth: the only power the devil has is the limited power that Jesus Christ has allowed him access to. All power in heaven and earth belongs to Jesus Christ (Matthew 28:18). As member’s of Christ’s family, He has given us authority over all the power of the enemy (Luke 10:19). When we submit to God, and resist the devil, the enemy will flee from us (James 4:7). We overcome Him by the word of our testimony and the blood of the Lamb. I saw – firsthand – that this is true truth! I’ll have to tell you the story sometime! AMEN! 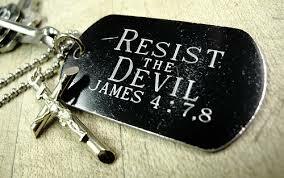 James 4:7 tells us how to resist the enemy- by submitting our lives to God FIRST! No one can resist the enemy without coming under God’s authority and obeying His Word first! Thank you for this very good and important teaching!